I know I've been spending a little too much time in the Scranton/Clarks Summit areas and it has been time to switch it up and hit a new town. It's more fun to cover a wide area, but with these crazy gas prices it's not always easy! After being pressed by friends and family who rave about a little place in Lake Winola called Da Vinci's, I decided it was time to cross this off my bucket list of top places to visit. So I teamed up with a fellow guest reviewer and headed to the lake. 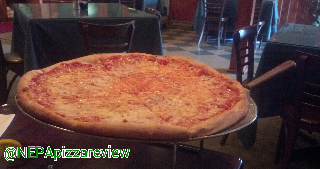 Da Vinci's by the Lake is now closed, but they have opened a new pizzeria under new ownership in downtown Scranton! Some people may remember this place as the Eastbay, which was a little rough around the edges in its hay-day. When we entered, I was really impressed with the upgrades in decor and layout. It was pretty classy yet relaxed. A great place to grab a beer or glass of wine and your favorite meal from the surprisingly expansive menu of italian offereings. 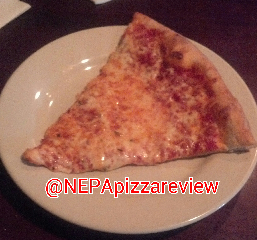 We ordered a large cheese New York Style pizza from the menu, as I continued to stick to my plain pizza roots. As the pizza was delivered to our table, I was impressed by the preparation and craftsmenship of the pie, not to mention the hot steam coming off of it indicated a quick transition from the oven to the table. The first thing I always check out on any New York Pizza is the crust. This immediately tells you how good of a pizza maker you are dealing with. If you pick up your slice and it flops down limp without any resistence, you probably have an inexperienced pizza maker who stretched the dough too thin on your hands. I also look for the little (or big) bubbles in the dough. Big bubbles which raise so high that the cheese doesn't cover it indicates a really fresh dough which hasn't risen all the way yet. In this case the dough was stretched perfectly even throughout with a medium-sized outer crust, which would indicate that this pizza guy (or girl) knew what he or she was doing back there. There were only a few small bubbles, which is my favorite, and would indicate that the dough was probably risen properly before baking. I did however find the crust to be slightly undercooked and a bit doughy, but nothing that would ruin the experience or taste. Perhaps the oven could temperature could be lowered to encourage a more even cook, but now we're splitting hairs! My co-reviewer found the sauce to be quite well seasoned, possibly a pinch too seasoned for his liking? I, being a fan of a zestier sauce did like the level of oregano, garlic, and pepper blended in. The nice thing was that no matter the preference of seasoning, you could still taste the vibrantly fresh tomatoes in the mix. The cheese was also quite impressive, as it could not have been cooked any more flawlessly. 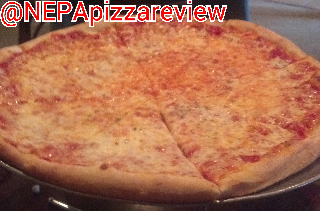 I wish my phone's camera did this pizza more justice, because it really was a work of art. This was a good quality brand-name mozzerella which does make a big difference. The cheaper cheeses tend to have less moisture and are more brittle when you bite into it. The better mozzerellas tend to stay moist, creamy, and a bit stringy after you bite it and pull it away from your mouth. Overall, I was impressed by this pizza in the sense that if I were to open a pizza place, this would be the type of New York Style pizza I would be working toward. (don't worry Da Vinci's, I'm not trying to copy your recipie, and I'm certainly not going into business!). 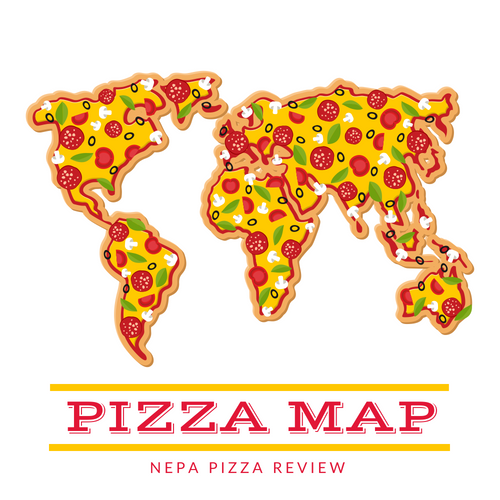 It's a well balanced pizza with good, simple flavors, quality ingredients, and has flavors which would be appealing to a wide variety of pallets. A great flagship offering to put on your menu, kudos! This classic NY pie is a clear winner. The dining experience is very good, and we thoroughly enjoyed just about everything about our visit. This would be a cool place to take a date for a quiet, casual night out on a weekday, or for a nice family dinner on a weekend. I hear that Da Vinci's gets quite packed on the weekends, so that might defeat the purpose of the quiet night out, but in any case it's worth a trip over to Lake Winola for a solid dinner and nice atmosphere.